The first thing to recognize is that a wooden floor – cork included – should never be cleaned using murphies’ oil soap (spelling altered). This type of formula can and will destroy modern finishes in a very short length of time. This same product will also ruin your warranty and most likely any chance you have of refinishing the floor in the future. Oil soaps are not to be used with wood. Even woods treated with wax or oil. Cork floors are now finished with the same finishes found on hardwood floors. There are three main categories for finishes: water based, solvent/oil based and wax. The first two categories will have the same form of maintenance cleaning procedure, the third category – wax is in a league all its own. Water based products include: water based/waterborne urethane, water based/waterborne polyurethane, water based/waterborne acrylic. All three have the same maintenance procedures that are easy enough once you have found the correct cleaning product. Solvent based products are also known as “oil” based products and they come in urethane and polyurethane. Acrylic is rarely found in a solvent form, but it is out there. Be aware that “oil modified” must be treated in the same way as “oil based” and it should not be applied over a water based/borne product. Solvent or water based/borne products have the same maintenance needs. 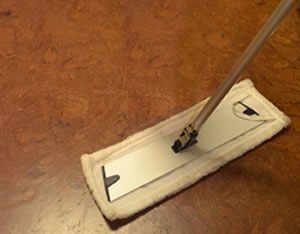 Sweeping or vacuuming and the occasional damp mop to remove oil, mud or dried spills. The damp mop is the subject here. A pH neutral wood floor cleaner used according to instructions are your safest way of keeping a cork floor – or any wood floor – happy and health for years to come. Modern day wood floor cleaning products are chemically balanced (pH neutral means it is not too acidic or too alkaline) and they have low levels of “surfactants”. Surfactants are the things that cause bubbles – or what makes soap soapy. Surfactants are the things left behind once the water evaporates. The lower the level of surfactants the fewer problems you will have with your product in the future. This is why “soap” of any sort is considered a no-no on wood/cork floors. Even “enviro cleaning products” will have high levels of surfactants (more than 5%). A floor frequently cleaned with these “vegetable soaps” will require replacing in a very short amount of time; some in as few as four (4) years. If you have a wax finish – you will need to work with the products that are required of you by the manufacturer. Cork floors that are “hard wax” or “hot wax” finishes are very tough with little in the way of scratches or marks left behind. These floors also require “waxing” (hard wax is normal after install) every 6 months in a low traffic home or more often in high traffic spaces. A hospital or retail store would require a wax to be applied every 3 months. Without this ever-refreshing layer of wax, the finish quickly wears through. Busy households that do not have the time/finances to have someone apply fresh wax every 4-6 months should move away from this form of finish.